This is the website for ‘The Musicians’ Union: A Social History’ – an AHRC and ESRC funded research project based in the School of Culture and Creative Arts at the University of Glasgow, which ran between April 2012 and September 2016. 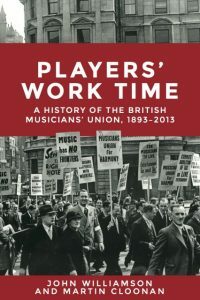 The research culminated with publication of a book, Players’ Work Time: A History of the Musicians’ Union 1893-2013. This is published by Manchester University Press and is available now as a hardback, paperback and eBook. As part of the work we also organised a month long exhibition at The Mitchell Library in Glasgow (which will visit London and Manchester later in 2016), a two day conference at the same venue on the theme of musical labour and a gig at St.Andrews in the Square. These pages act as an archive of some of our work during the course of the project. Please have a look around. You can also use the site to contact us or to join the Working in Music network, where researchers interested in similar matters can informally keep in touch.